Ah, swimsuit season. It’s the most painful time of the year. I know very few women (or men, for that matter) who look forward to baring their bodies, soft and pale from winter, for that first summer barbecue or pool party. However, this has more to do with pressure from the health and beauty industries to conform to profitable standards of attractiveness than it does with our actual bodies. As soon as it gets warm enough for short sleeves, the advertising industry is at our throats, snarling slogans for fitness packages, dietary supplements and protein bars. “Beach body” is less of an aspiration and more of an ominous threat, looming from magazine covers and chasing you down the treadmill. I remember countless childhood trips to the grocery store that ended in me glancing nervously at the women’s magazines in the checkout line, wondering if I was doing enough to blast belly fat or resize my thighs. This model of marketing—telling women their appearance is bad and offering to sell them the means of improvement—has enjoyed unfettered success for just about as long as gendered advertising has existed. The combined industries of health and fitness (and all the juice cleanses, shake weights and teatoxes that these industries include) weigh in at over $600 billion annually, according to Women’s Media, Inc. But this all-encompassing industry might not be gaining the sustenance it needs from the world’s collective insecurities. From shifting preferences in food consumption to increasing body diversity in entertainment, Americans seem to be moving on from their toxic relationships with the weight loss industry. 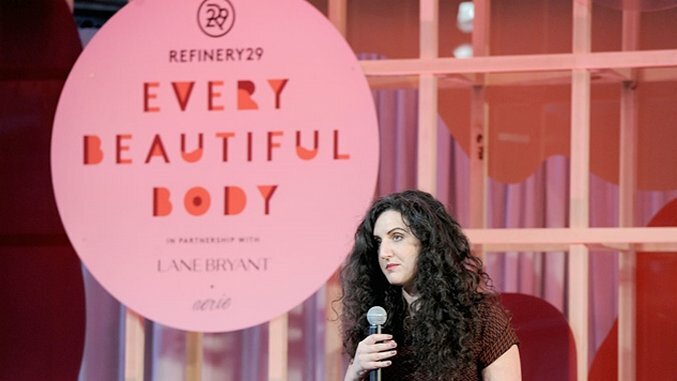 And there’s a new, more appealing partner in town: body positivity movements, which are shouldering their way onto the beauty market stage. Body positivity, or the notion that bodies of all shapes and weights should be celebrated and affirmed as human, directly contradicts the age-old messaging of the weight loss industry. Rather than telling consumers to make their bodies “beach-ready,” advocates of body positivity affirm that every body is a beach body. Dove’s “Real Beauty” campaign was unique back when it first plastered a small diversity of female bodies on a billboard in 2004, but it sparked a trend that today seems ubiquitous. Sports Illustrated featured its first “plus-size” model on the cover of its 2015 swimsuit edition. American Eagle gained applause for a series of ads with its lingerie brand, Aerie, where teen models’ tattoos and cellulite dimples were not photoshopped out. More and more, we can see the age-old “fight the fat” model of advertising being replaced by a “happy and healthy” approach, where body diversity is championed and restrictive beauty standards are loudly rejected. This is, for the most part, a good change. I like to think that the twelve-year-old girls trailing behind their moms in the King Soopers line experience just a little less self-loathing than I did when confronted with another “flat abs NOW” magazine cover. But despite how much better body-positive marketing is than its alternative, it still deserves scrutiny. She went on to say that this trend of feminist-inspired advertising is “regulating our emotions and regulating the way that we feel about our looks, and not just our looks themselves.” And this is true. Everywhere consumers turn these days, they find messages of wellness, happiness, wholeness. The aspiration, it seems, is no longer the perfect body but the perfect mindset about the body. At its worst, weight-loss marketing tells consumers that they need to look better. Similarly, body positivity in its least flattering light tells us that we need to feel better. An ad from True&Co, the lingerie startup recently acquired by Calvin Klein owner PVH, popped up in my Facebook Feed recently. It features five women with soft bellies and dimpled thighs, and asks, “Who wouldn’t want a bra that feels ‘like being naked, but better’?” Of course we all want that. That sounds amazing. But we also want to feel like the women in the advertisement: lumpy, bumpy, and beaming. Happy with our bodies and comfortable in our skins.